Now that Hillary Clinton is the official Democratic Party nominee for president, let’s look back at the closest primary and caucus contests. This is technically a choropleth map using a bi-polar color projection, but with a twist. Instead of emphasizing values on the extreme ends of the spectrum, this map highlights those values closest to the middle. 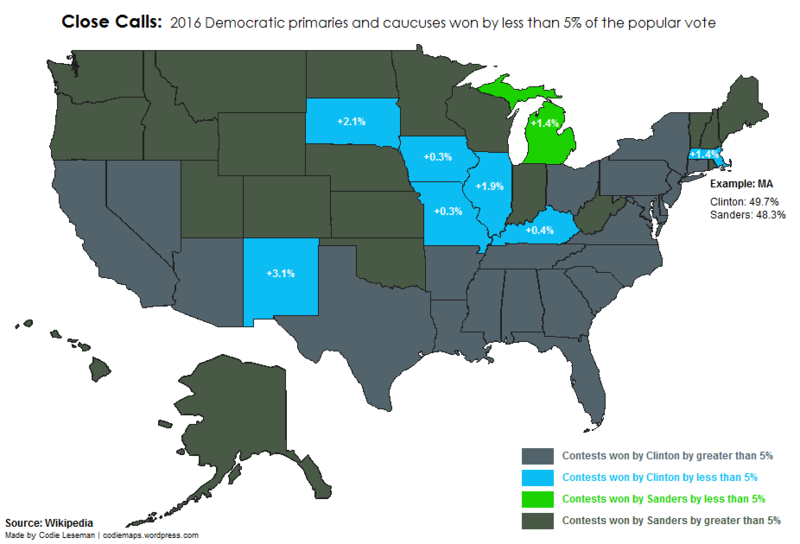 I was struck by how most of the close contests were ultimately won by Hillary Clinton, so I decided to make this map. The most time consuming part wasn’t the map itself, but rather calculating the percentages to show in each state. There are too many different ways to calculate these results, so I took the totals of each state’s popular votes (or “state delegate equivalents” where applicable) and did the math myself. Fun fact: Missouri was the tightest race, with a margin of only 0.25007% between the two candidates. This is the same as a hypothetical election split 200 to 199. 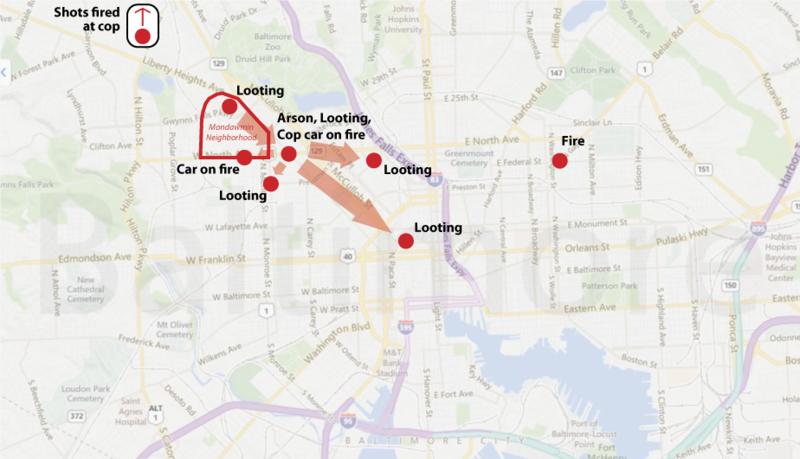 This is a map of the events that took place in Baltimore, Maryland on April 27, 2015, according to an article in the Baltimore Sun. The area outlined in red is the Mondowmin neighborhood, where looting at the Mondowmin Mall started the series of events that continued throughout the evening. Keep in mind the location of this neighborhood and each dot relative to rest of the city as you scroll through the following maps. In general, dark = more. This one took me less than an hour to make. Just today, the Iowa DNR released five decades of Iowa aerial photography, dating back to 1930. Naturally, this presents a great GIF making opportunity. This map shows the southern portion of Waterloo, Iowa between Ansborough Avenue (left) and the Cedar River (right). The Crossroads Shopping Center, built in time for the 1970 photograph, still stands today as the Waterloo/Cedar Falls area’s largest retail center. 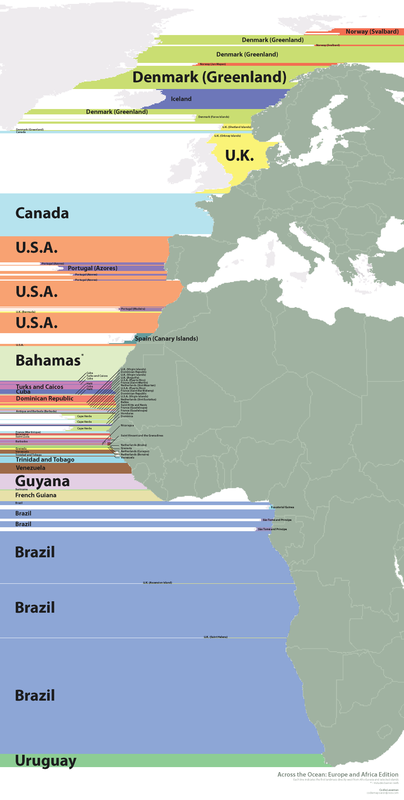 I created this map in response to the original Across the Ocean map published in the Washington Post on May 22, 2014. It illustrates which country (and sometimes kingdom) is situated due west across the ocean from Europe and Africa. A more detailed version of this image (6263 × 3077) featuring the entire world map is available in PDF (320 kB) and PNG (366 kB) formats. Update: In response to input received from reddit.com users, I have included a GIF (642 kB) image featuring all of Europe and Africa vs. just continental Europe and Africa. Which Country Are You Closest To… in China? These maps have been gaining popularity over at www.reddit.com/r/MapPorn. 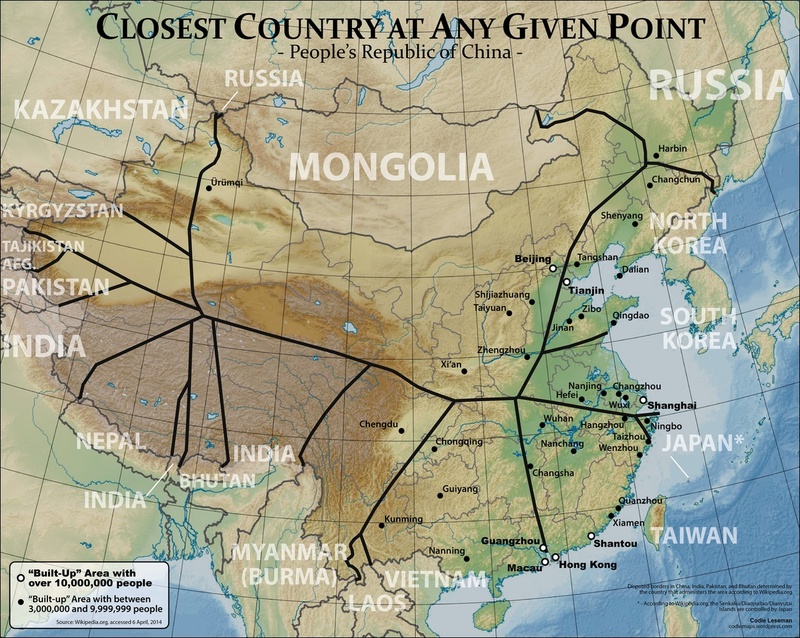 I’ve decided to take up the task of dividing the country with arguably the most neighbors, China (tied with Russia at 14, excluding Hong Kong and Macau). I used Google Earth to painstakingly locate the center points for three nations at a time, one point at a time, and then identify the surrounding areas closest to each neighboring country. This one’s just for fun. 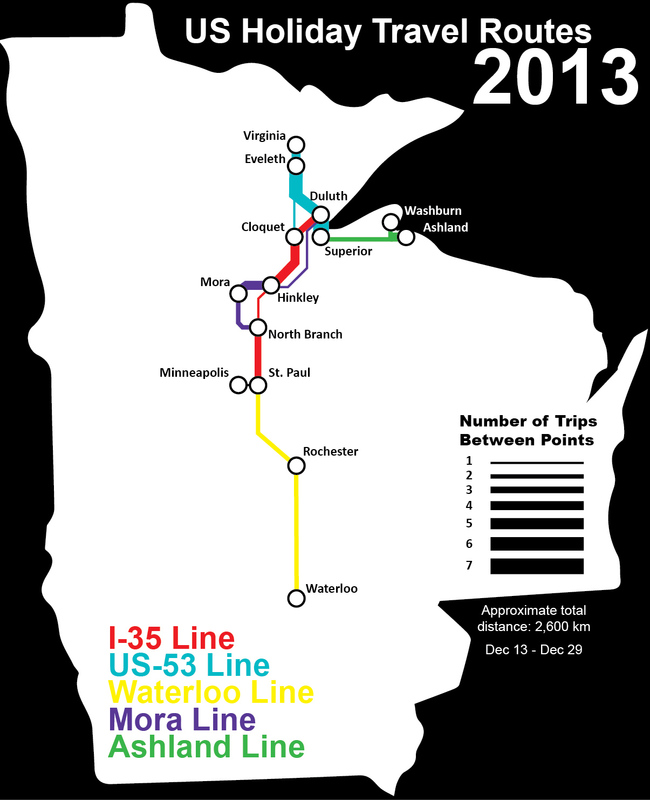 Each line represents the number of times I traveled between two points since arriving in the US on December 13th. The total distance is over 1,600 miles (2,600 kilometers). After scouring the internet for a good map of Ho Chi Min City, Vietnam (also known as Saigon), I decided to make one myself. This is a political map showing select districts within the city. The main issue with other maps is that they don’t clearly show all of the main districts in the core of the city. I remedied this by omitting large parts of the city, which are primarily used for farmland, while still maintaining a relatively small (i.e. zoomed-out) scale. 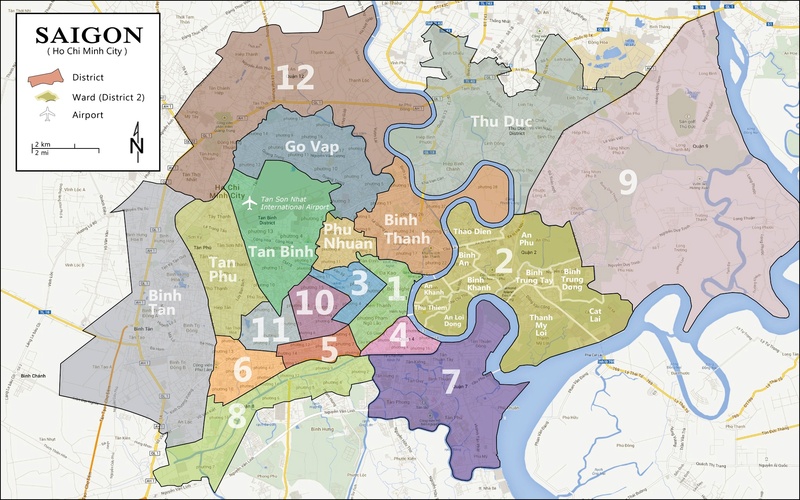 This map can be used when searching for housing, planning a trip, or simply navigating through Ho Chi Minh City. I used spatial data from Google Maps to form the polygons used in this map. District 2 is further subdivided into wards, as some realtors refer a property’s ward when describing its location in this district.